Simple conditioning moves that should be part of any runner’s training routine. Training for a run isn't just about clocking up the kilometres in the legs. Exercises that target the core, help build power in your legs and work on your glutes are an important element of your training program. Here are six strength exercises to incorporate in your training routine that should make you a better and stronger runner. With or without weights, curtsy lunges are a great exercise for strengthening your glutes while focusing on your balance. Stand with your feet hip-width apart, step your right leg back and cross it behind your left (as if performing a curtsy) and lower your body straight down until your front leg is at 90 degrees. Tighten your abs to help maintain a steady pace and upright posture throughout the exercise. Repeat 12 times before swapping legs. Tip: fix your eyes on a spot to help maintain balance. A classic, explosive move that helps you build power in your lower body, activates your abdominals and gets the heart rate going, mountain climbers can also be a great way to warm up pre-run. Start in a push up position with your body in a straight line and your arms in line with your shoulders. Raise your right knee up under your chest, ensuring your body line remains the same, and bring it back down and raise your left knee. Once you're comfortable with the move you can start to build up the pace, looking at 10 reps at a time. Body weight squats are an effective way to work your glutes and strengthen your legs. Lean back as if going to sit on a chair, ensuring your weight is in your heels (so you could wiggle your toes) and then power back up again, thrusting your hips forward at the top. Tip: Hold your hands out to help with balance. While the planking craze captivated social media a couple of years back, this exercise is an enduring must for building core strength. Hold the position on your toes with your elbows directly below your shoulders. Work on keeping a strong line, maintaining regular breathing and ensuring your hips don't drop down. Try holding for 30 seconds to start with and continue to build this over time. Feel the burn with these scissor-like lunges that see you switching legs of your lunge mid-air. Start by standing with your feet together, lunging forward with your right leg so your back left knee is just off the ground, then jump up and push your left knee forward into the lunge. Land softly to avoid injury and if you find this one too strenuous, just take out the jump and try some walking lunges, ensuring your back knee is getting as close to the ground as you can. Work the chest, core, biceps, triceps and back with the old school push up. 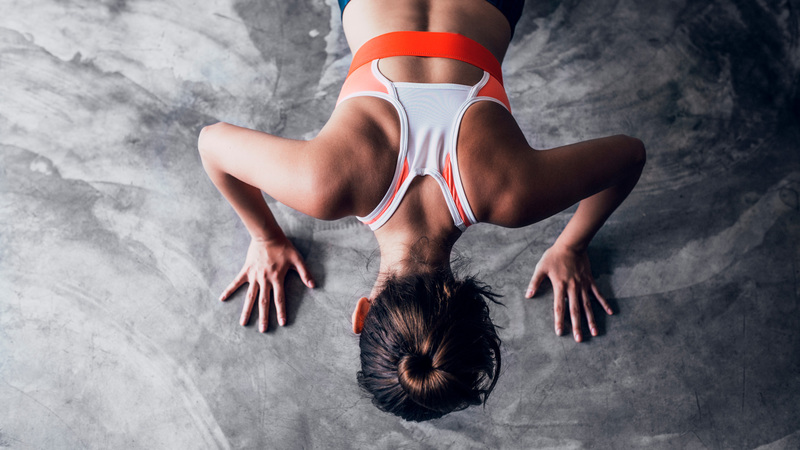 Start your push up face down on the floor and place your hands alongside your chest. Move upright from here with your body weight resting on your palms and toes. Work all the way down until your chest hits the floor and come back up again, slowing your push up down to ensure your technique is correct. Drop to your knees if you find a full push up too strenuous and focus on working through the full extension.